I started my day inside the theatre, more specifically in the lounge that I shared a photo of on Tuesday. But right after that I stumbled onto a real treat. I went into the red carpet area to take photos of the carpet now that it has been laid down (although it is still covered for protection) and got caught up in the sweep of media entering a Food & Wine preview event. 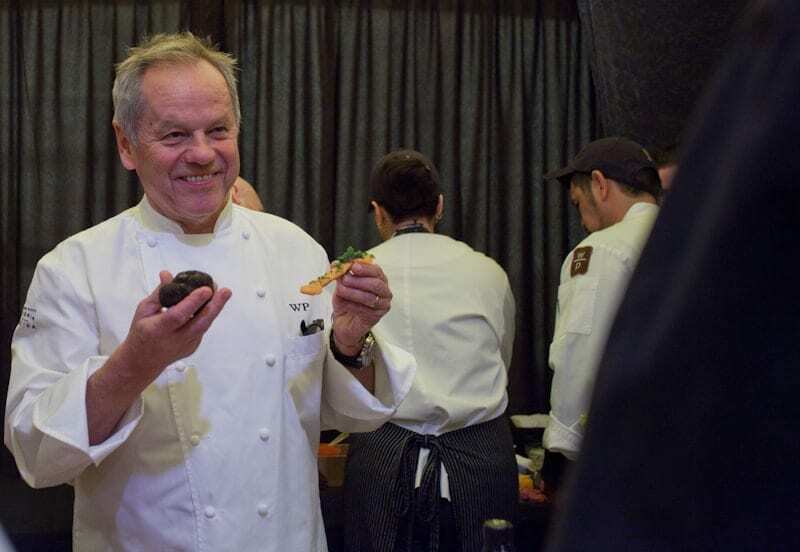 As a foodie I could not have been more thrilled to see Wolfgang Puck himself showing off his food for the evening. 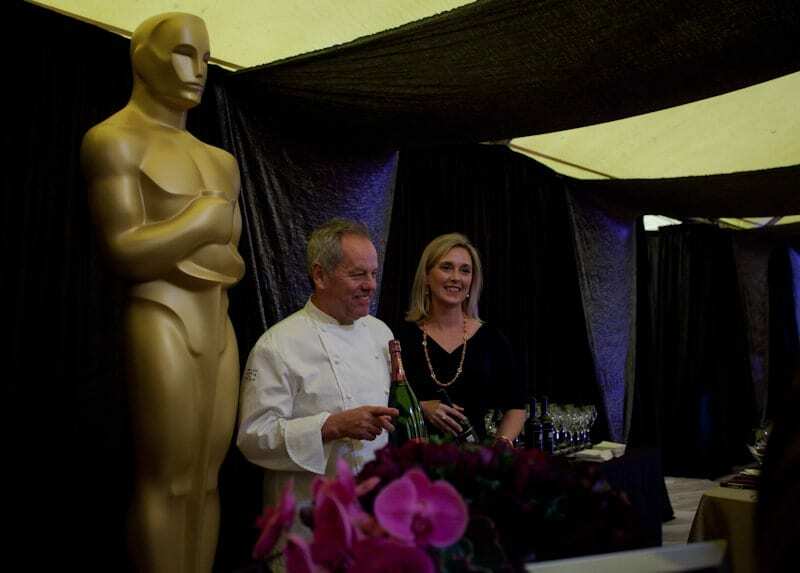 After the Oscars show everyone goes to the Governors Ball to celebrate and Wolfgang Puck is the official caterer every year. 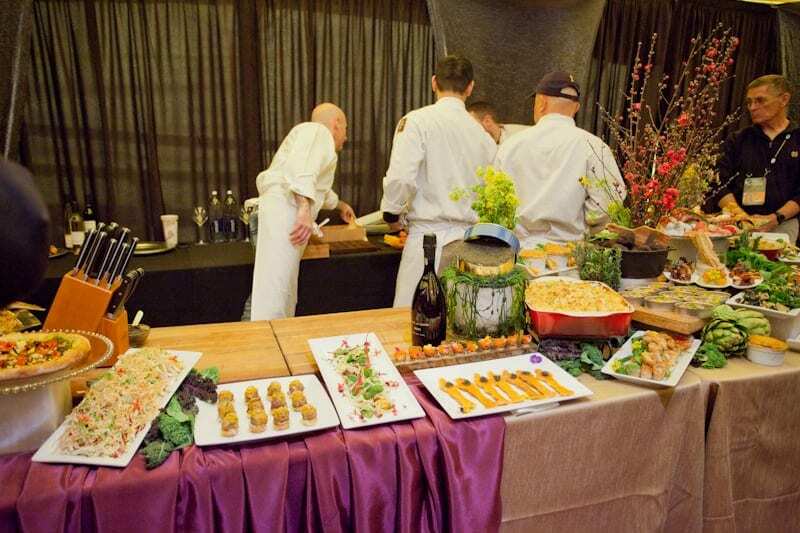 He selects the food and spirits and his faithful pastry chef Sherry Yard does the sweets. Here is Wolfgang with one of the Sterling Wine reps and Oscar himself. A sampling of the food for the evening of the Oscars, including Oscar-shaped salmon. 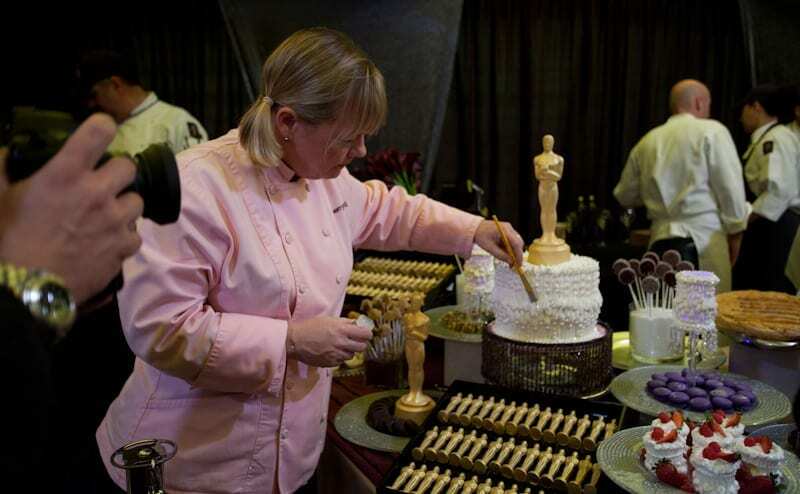 Sherry Yard dusting the Oscars cake with gold. 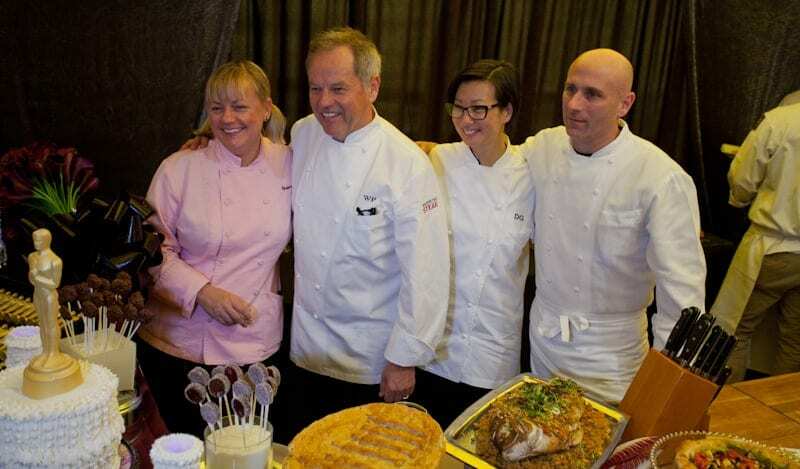 The Oscars culinary team including Wolfgang and Sherry. I would be happy too, if I were holding a truffle this size! 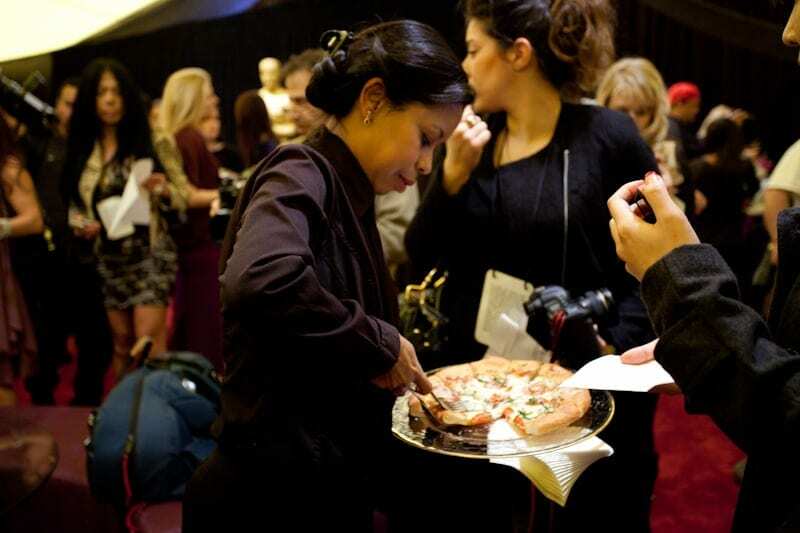 What’s a Wolfgang Puck event without pizza? 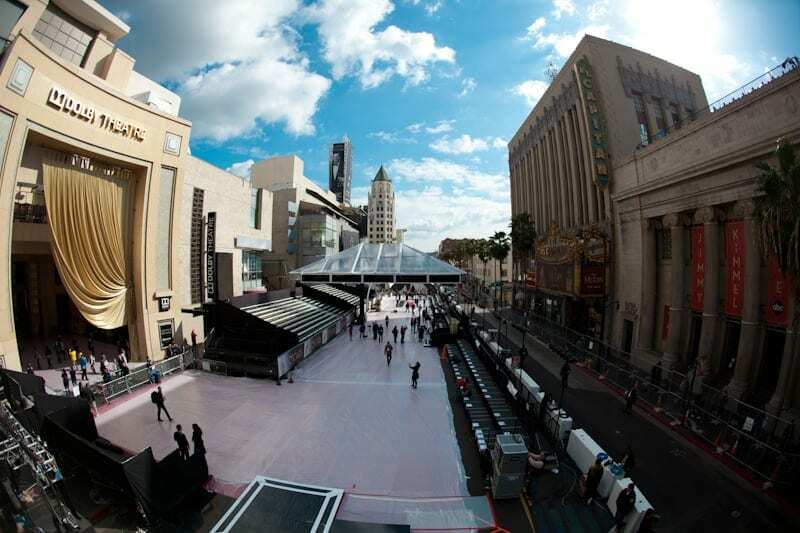 Afterwards I went up on the scaffolding that will accommodate some of the camera folks during the red carpet event, it is a beautiful spot to play with my fish-eye lens again! I also chatted up some Parisian press that I found up there (always the francophile!). 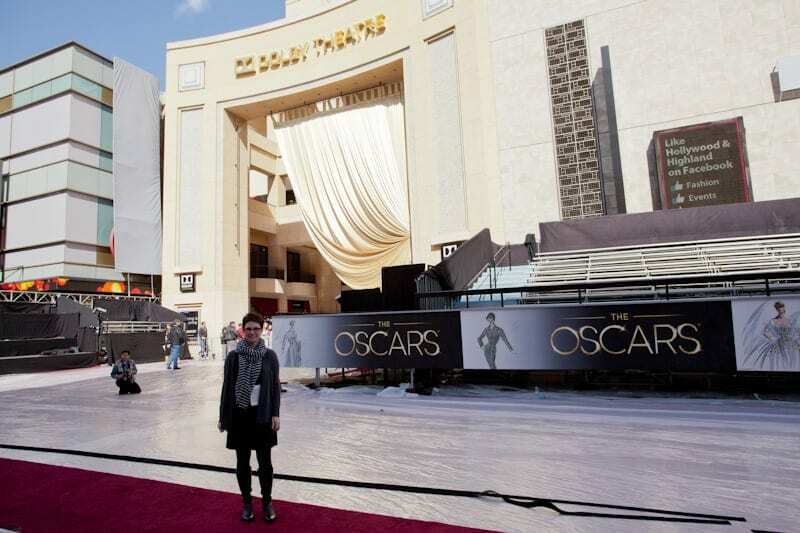 I couldn’t resist getting a photo of myself taken on some red carpet, it may only be a small strip, but it was still fun! 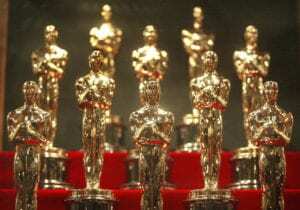 Photo info: The Oscars image is a fully paid for (by me) and licensed image from www.istockphoto.com. @Renata, I am pretty normal 😉 but it is fun. Since my english is not that good, sometimes I can’t express my thoughts with the right words. i want some of that food from wolfgang. how do i get to go to that party? Wow, that food looks amazing! Looks like a fun day. Can I be your new best friend or your faux partner? LOL. Andi, love all the pictures. Hope you are enjoying this time, you are getting to do something everyone else dreams of. Keep the pre photo’s coming.